I love putting a little humor into some of my things. I made one of these for my hairdresser and she absolutely loved it! She said it really made her laugh. 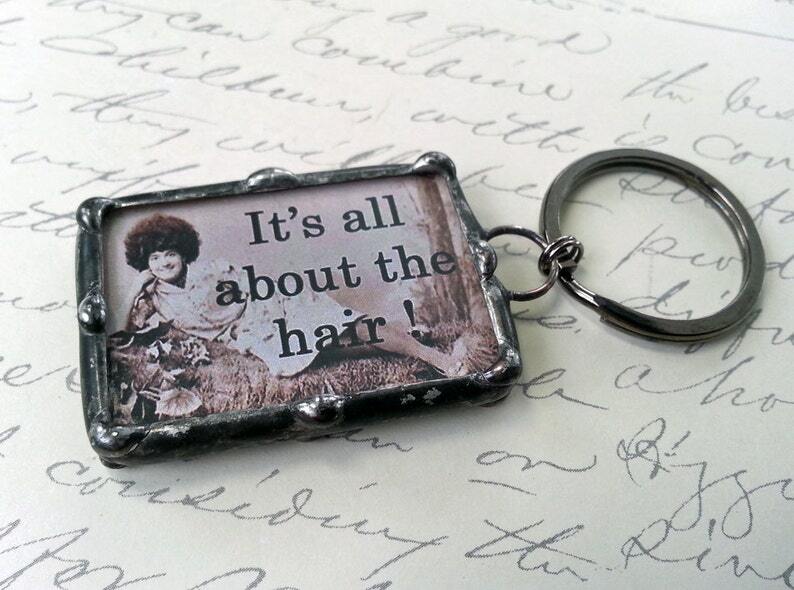 If a key ring doesn't suit you, let me know and I can make it into a bookmark or something else. There may be an upcharge depending on the item you choose. The charm measures 1x1.5" and is attached to a key ring. ♥The design features a digital art collage using a vintage image on the front and a whimsical quote on the back. ♥ This one is ready to send as it is. If you want it personalized there is a slight upcharge. Purchase this listing and let me know that you want the hairdresser image on the front. ***All of my charms are hand soldered using the tiffany method as in stained glass work. I take great pride in the craftsmanship of my items and each one will come to you polished and in a pretty packaging ready for gift giving.